With a blast that made skyscrapers tremble, an 83-year-old steam pipe sent a powerful message that the miles of tubes, wires and iron beneath New York and other U.S. cities are getting older and could become dangerously unstable. The steam conduit that exploded beneath a Manhattan street at the height of rush hour Wednesday, just a block from Grand Central Terminal, was laid when Calvin Coolidge was president and was part of a system that began providing energy to city buildings in 1882. Investigators are still trying to determine what caused the explosion, but some experts said the age of the city's infrastructure was a possible factor. Pipes don't last forever. "This may be a warning sign for this very old network of pipe that we have," said Anil Agrawal, a professor of civil engineering at the City College of New York. "We should not be looking at this incident as an isolated one." Meanwhile, the city officials have determined that there is no asbestos in the air, but that there is contamination in the dirt and debris that settled on the ground, reports CBS News correspondent Bianca Solorzano. People who have to be in the area are wearing protective face masks. From Boston to Los Angeles, a number of American cities are entering a middle age of sorts, and the infrastructure propping them up is showing signs of strain. DePaul University transportation professor Joe Schwieterman said his city of Chicago, where much of the infrastructure dates to the early part of the 20th century, is now faced with tough choices on what to fix first. "The aging infrastructure below the streets is an enormous liability for the city," Schwieterman said. "We know it needs modernization but the cost is staggering. We're forced to pick our battles wisely." Thousands of miles of underground water and sewage pipes are nearing the end of their expected life, sometimes with a bang and a flash flood. Electrical systems, operating with components that are decades old, have been groaning to handle record power demand. Parts of New York were plunged into darkness for a week last summer when a series of power cables failed in Queens, and much of the Northeast was blacked out when power transmission systems failed across several states in 2003. In New York and Boston, aging sidewalk utility panels were blamed for delivering electric shocks to pedestrians and pets in wet weather. The American Society of Civil Engineers estimates that it will take $1.6 trillion over the next five years to get the nation's roads, bridges, dams, water systems and airports into good condition. But replacing old parts in a labyrinth of cables, tunnels and piping, often extending hundreds of feet down, is rarely easy. "The fact that all of this stuff is crowded together in a very small space can also make accidents worse," said Rae Zimmerman, director of the Institute for Civil Infrastructure Systems at New York University. "When one thing goes, other things go. When you have a water main break, it will wash out a street and break a gas line," she said. In New York, home to the largest steam system in the world, steam is pumped through more than 100 miles of mains and service pipes to customers such as the Empire State Building and Rockefeller Center. It is also widely used by dry cleaners and hospitals. Just how much of a factor aging infrastructure was in Wednesday's steam main break is unclear. Consolidated Edison, the utility that operates the steam system, insisted its equipment is in good shape. The company said it is spending $20 million this year on upgrades, and has been removing older cast-iron components, eliminating asbestos from manholes and installing improved joints less likely to fail. "I don't think there is any reason to worry," New York Mayor Michael Bloomberg said in the aftermath of the blast, which killed one person and injured dozens, some seriously. "I think that you see that these pipes generally perform fine." Tests showed the explosion did not leave asbestos in the air, but the toxin was found in some solid debris and dust that settled after the blast, the city said Thursday. Some speculate that rainwater or water from a main break somehow seeped onto the pipe, and the sudden interaction between cold water and super-hot steam burst the conduit. Steam explosions, in fact, are rare and have decreased in recent years. 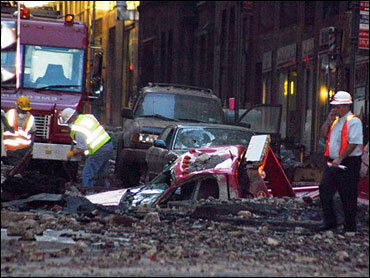 The last major explosion in New York, in 1989, killed three people. Smaller steam systems have also operated largely without mishap in Chicago, Boston, Philadelphia and Baltimore, although a pipe explosion in the nation's capital near the White House badly injured two workers in 2004. In Boston, Mayor Thomas Menino said his staff asked Trigen Energy, the operator of 22 miles of steam infrastructure in the city, for assurances the system is safe. Some pipes there date to the 1930s, and the company is making repairs, including work outside City Hall that Menino can watch from his window. Con Ed said some components of the system are examined about every six weeks, but steam mains underground are generally not inspected because doing so often requires digging up the street. That is something that should change immediately, Agrawal said. Robotic probes can detect corrosion or damage to steam pipes from within, without having to dig them up, he said. "They have to start looking at the entire system," he said. "Imagine something like this exploding under Grand Central? Or under Broadway?" Some New Yorkers have had enough. "They need to do something about the infrastructure. It's really getting out of hand," said Steve Raphael, a lawyer who had to talk his way past a police blockade to get to his office near the blast zone Thursday. "It could take 20 years, it could take 30 years, but they've got to take 10 blocks at a time and replace things before they break."